Simple as Black and White, Elegant as Silver! 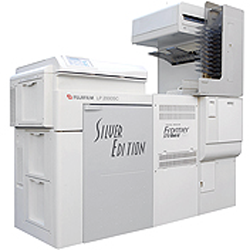 The “Silver Edition” Frontier 370 Black & White printer prints digital files & negatives directly on silver halide with the first, true, laser minilab conversion with an output up to 400 8x10’s an hr! The “Silver Edition” is based on Fuji’s® Frontier 370 because of the 370’s unprecedented reliability, speed and worldwide access to service and parts. Unlike some systems that were built to different specs in different countries, the Frontier line was built to one set of specifications. Now specialty labs large or small can produce striking, true silver halide B&W prints, free from color casting or bronzing using Ilford Express Digital RC Paper®. Meet the increasing demands of fine art photographers and capture your share of the rapidly growing lomography enthusiast market. ILFORD EXPRESS DIGITAL® has excellent contrast, sharpness & surface finish that gives superb continuous tone black and white images digital files prepared from black and white, or color film negatives, positives, prints & digital originals.